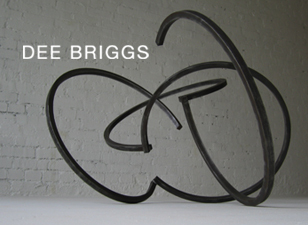 Dee Briggs fabricates works in steel and bronze at various scales. Her current work explores chirality, or three-dimensional handedness, which is pursued through the study of basic principles of geometry and symmetry. Briggs is very interested in the resulting relationships of line and plane and the way in which each composition describes or implies space. The resulting sculptures appear to be random and often whimsical, yet, they are in fact highly ordered. Dee Briggs divides her time between Pittsburgh and New York. She was born in Burgettstown, Pennsylvania and raised in Wellsburg, West Virginia. Briggs received two degrees in architecture from the City College of New York (BA ’97) and from Yale University (M.Arch ’02) on a full-tuition merit scholarship. After 15 years of studying and working in architecture, Briggs re-dedicated herself to making sculpture. In 2007 she also decided to leave her career in teaching architecture and fully devote herself to her artwork. Both her teaching and work in architecture have had tremendous influence on her sculpture. To date, all of Briggs work is made in steel or bronze and is fabricated, not cast. Briggs does all small-scale fabrication herself. Only the largest scale pieces have been made under the generous guidance and advice of professional sculpture fabricator, Bob Giza of Upscale Welding in New Haven, CT.
Briggs’ work is rooted in investigating the symmetrical operations of handedness. Handed is the common term for “chirality,” which is a formal condition often found in biology and chemistry. Objects that can exist as a left and/or a right through three axes mirror symmetry are handed – or chiral. At this time, Briggs’ work has developed into two categories of handedness: there are nuclear compositions typically consisting of one left and one right, which are brought together about their center, and there are linear compositions, which consist of many lefts and rights assembled end to end by some set of rules. The latter can be made of a limitless number of individual elements [4, 10, 50….]. At each joint Briggs has several choices formally for that rotation and she makes each decision with respect to both the local formal and spatial condition as well as the overall formal composition. Both composition types, though appearing whimsical and random, are in fact highly ordered. As the work develops into various formal positions she studies each composition as line and plane that begin to either describe or imply space. At this time Briggs is particularly interested in the potential spatial implications of the work and eager to realize it at a large scale.